Sometimes doing the easiest thing may be expedient but it is often not the best. Last night for Wildcard Sunday we bought some prepared ribs at the grocery store and a bag of shredded cabbage with a dressing to make cole slaw. John heated up the baby back ribs in the microwave and we were treat to mostly bones with very little meat for a pretty steep price. The cole slaw dressing was so sweet that we had to do significant fixing to make it edible. In addition I also made another Greek cucumber salad which I think John is getting sick of. My suggestion is “Do it yourself!” and if it seems like too much work or trouble then choose something else instead! A simple egg dish, a thrown together soup, or a tuna salad sandwich is much more satisfying than an expensive disappointment. This morning we sat down and created our menu for the week. It includes two chicken meals, two seafood meals, two vegetarian meals, and one celebration lunch since Tuesday is our actual anniversary. A trip to the grocery store is imminent. No shortcuts this week!! 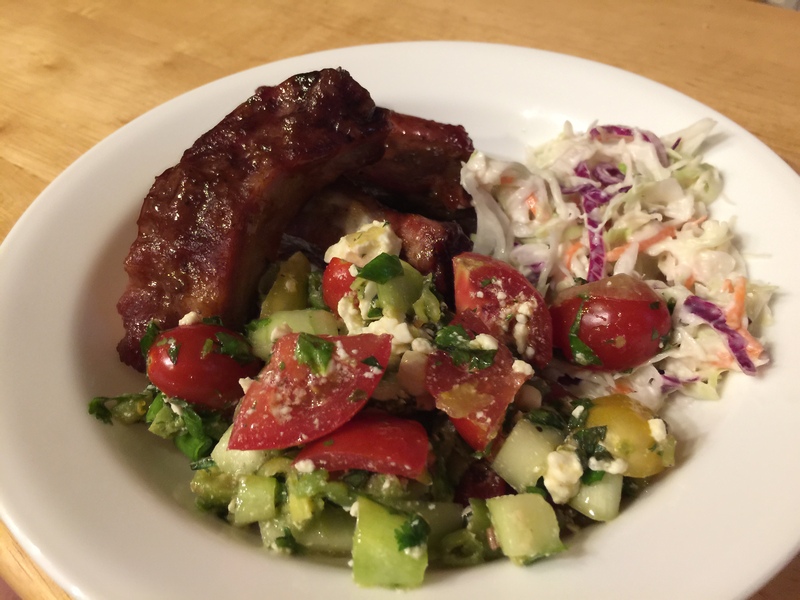 This entry was posted in American, Kitchen tips, Pork, take-out, Vegetables and tagged cole slaw, cucumbers, feta, ribs, tomatoes. Bookmark the permalink.